As the highest peak of the Qinling Mountain, Mount Taibai, 3,767 meters above sea level, is situated at the juncture of Mexican, Taibai and Zhouzhi counties in Shaanxi Province. With an area of 54,000 ha, it is 120 kilometers from Xi'an. 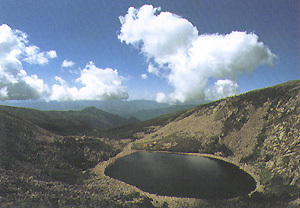 Mount Taibai is noted for its complicated and unique natural conditions, with peaks towering into the clouds unfolding in all their majesty. From the foot to the top of the mountain there are five natural climate zones, with more than 1,690 species of animals and insects, and more than 1,850 species of plants. Hence it is listed as a national forest park. Formed mainly of granite, Mount Taibai, eroded by wind and rain for thousands of years, has many weirdly-shaped, lofty and steep peaks, marked by the primitive features of virgin forests and sites of ancient glaciers of the Quaternary period. The beautiful scenery consisting of weird-shaped rocks and lakes formed by ancient glaciers and alpine plants are very appealing. Along with the gradual improvement of its tourism facile-ties, Mount Taibai has become an ideal place for holidaymakers and hikers.